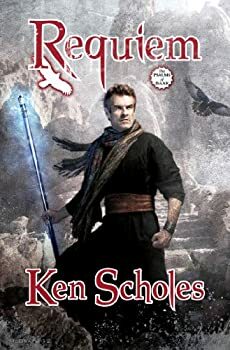 Requiem is the fourth book in Ken Scholes PSALMS OF ISAAK series, which while having a few minor issues throughout has mostly been a fresh mix of fantasy and science fiction, filled with intriguing characters and exploring complex issues involving the intersection of religion, technology, and society. Requiem continues that exploration, though in weaker fashion than the prior three novels. By now, the plot has grown extremely complicated, so I’m not going to offer up much of a plot recap, which should probably clue you in that this is a series that requires reading the books in order. While earlier books had many of the main characters together or at least paired up, in Requiem, Scholes has chosen to separate them, sending several all the way to the moon (and separating even the ones there). The Gypsy King, Rudolpho, helplessly outnumbered and outplanned, is forced to collaborate with the Crimson Empire’s just-landed invasion force. His wife, Jin Li Tam and his son Jakob have been taken to the Empire’s capital city so that Jakob may be betrothed to the Crimson Empress and help fulfill some of their religious prophecies. Her father, Vlad Li Tam, has come into possession of the uber-powerful staff of Y’zir and is on a one-man invasion of his own. Winters has led those of her people still loyal to her out of the Marshes in hopes the Dream, which promises their return home, will come true. Neb, revealed last book to be the son of the Younger God Whym, as well as the prophesied Homeseeker, and Petronus, along with a group of metal men, have flown to the moon and are seeking entry into the Moon Wizard’s tower. And two new characters arrive on the scene — a young girl named Marta and a mysterious metal man who has no memory of who or what he was. As before, Scholes structures his novel via a series of short, shifting POVs. In some of the earlier books, I felt this at times was overly distracting and also diminished the emotional impact of some of the storylines. While I found that true now and then in Requiem, it was much less of an issue, as the chapters were for the vast majority of the time as long as they needed to be, with consistently smooth transitions. The short chapters, its sub-400 page length, and Scholes’ smooth prose style make Requiem a quick read. This despite the healthy cast of characters and a by-now convoluted plot, filled with shifting alliances, betrayals and apparent betrayals, and questions of just who are the good guys and who the bad guys. Scholes’ pattern of keeping those questions up in the air — who is working for and with whom and why — has long been one of the better aspects of the series, and Requiem keeps us guessing with regard to several characters, both new and old. That said, I found Requiem less satisfying than the earlier novels. One reason is that several of the storylines feel a bit stagnant and/or one-tone. Vlad Li Tam, for instance, who has always been a complex character filled with shades, here is reduced to what I’d call a too-simplistic plot line. The staff he carries makes him incredibly powerful, so much so that there is never any tension — when he needs food or water, he makes it. When he needs information, he compels people to speak. When he needs, well, you get the point. His story does have a strong close, but up to that point it isn’t all that interesting. The same is true, though to a lesser extent, of Rudolpho and Jin’s storylines. Surrounded by their enemies, playing a taut game of appearances, these sections should be incredibly and constantly tension-filled, but are surprisingly and disappointingly placid. The sections on the moon, as with Vlad Tam’s sections, suffer a bit from things coming too easily (the sometimes-problem with god-like powers), but more so from things being too abstract and removed. In all these cases, the plot doesn’t compel enough and the emotional impact is either non-existent or too muted, save for the ending, where the emotions pack a wallop. The big exception to this is the plot line dealing with Marta and the mystery metal man, which from the very start is filled with tension, suspense, and emotion. As mentioned, Requiem is a fast, smooth read and it does hold attention enough to keep one going to the end, but it really comes alive when these two are the focus. Beyond plot and character, Scholes continues to explore complex questions of faith and technology and humanity: how faith can be used to manipulate, the moral implications of powerful technology, questions of means versus ends, questions about what does it mean to be human (growing up and father figures play important roles in this book and the series as a whole), about humanity’s propensities for both violence/self-destruction and exploration/creation. These questions go a good way toward making up for some of the novel’s plot problems. Requiem disappoints in comparison to its predecessors, falling into the “bridge book” rut a bit — things happen that move a complicated story forward, but without a lot of impact on the reader. It’s by no means a bad book, and it’s certainly a necessary one with regard to the series, but I would have liked to care a bit more, as much as I did before, about what happened to these characters. Release date: June 18, 2013 | Series: The Psalms of Isaak (Book 4) Ken Scholes’s debut novel, Lamentation, was an event in fantasy. Heralded as a “mesmerizing debut novel” by Publishers Weekly, and a “vividly imagined SF-fantasy hybrid set in a distant, postapocalyptic future” by Booklist, the series gained many fans. It was followed by Canticle and Antiphon. Now comes the fourth book in The Psalms of Isaak, Requiem. Who is the Crimson Empress, and what does her conquest of the Named Lands really mean? Who holds the keys to the Moon Wizard’s Tower? The plots within plots are expanding as the characters seek their way out of the maze of intrigue. The world is expanding as they discover lands beyond their previous carefully controlled knowledge. Hidden truths reveal even deeper truths, and nothing is as it seemed to be.